Venezuela’s diplomatic relations are straining to a breaking point as Nicolás Maduro prepares to begin a new term on January 10, 2019. Democrats’ gains among Latino voters from 2016 to 2018 were modest, and in some cases, there were losses. Representation matters, as does what language you speak. Council of the Americas will hold a conversation on the political and economic outlook for Brazil following the second round of elections. Latino politicians are running up and down the ticket for seats that would place them on school boards, in governor’s mansions, and on Capitol Hill. Issues that defined the presidential campaign remain front and center in the national dialogue. A unified and experienced government, a strong economy, and efforts toward gender parity were all on the agenda at AS/COA’s Latin American Cities Conference in Santiago. Incoming President Iván Duque’s team features a mix of veterans and relative newcomers. During Colombia’s June 17 presidential runoff, voters in Bogotá tell us about their choices and expectations for the next four years. Where does the second-time president stand when it comes to campaign promises? Colombia's next president "stands in a really good position to heal the polarization that marked the campaign," says La Rotta, head of AS/COA's media relations and an El Tiempo columnist. ¿Cómo sería la economía colombiana bajo el liderazgo de Iván Duque o de Gustavo Petro? Boosting growth, improving infrastructure, and increasing productivity: at AS/COA's Bogotá conference, participants discussed what lies ahead for Colombia's next president. Iván Duque leads Gustavo Petro by up to 20 points in four polls ahead of the June 17 runoff. A dam, turnout, and Venezuela could all play a hand in the May 27 presidential first-round vote. Días previos a las elecciones, tres destacados panelistas analizaron el panorama económico y político en Venezuela—y lo que le espera al país en el futuro. Experts weighed in on the candidates and what these elections will mean for Colombia's political scene in the future. The former senator from the ruling Colorado Party is expected to maintain the current president’s business-friendly policies with reforms to security, education, and health. Raúl Castro will hand off the presidency – likely to his vice-president Miguel Díaz-Canel – leaving Cubans to speculate on the true impact of the shift. The ruling party candidate defied polls to best conservative Fabricio Alvarado by double digits in the April 1 vote. Ticos cast votes for Fabricio Alvarado and Carlos Alvarado on April 1, Easter Sunday. Experts from Brazil, Colombia, and Mexico offered insights on their respective countries' races, from the role of social media to corruption probes. The country has presidential candidates across the spectrum, say columnists Álvaro Forero Tascón and Adriana La Rotta. And that’s a sign of just how far the post-conflict democracy has come. Recent legislative elections gave much-needed definition to a crowded field ahead of the May 27 first-round vote. The March 11 vote—the first in the FARC post-conflict era—will have significant implications for the May presidential vote. Polls suggest the main conservative party will pick up a larger portion of seats in March 4 legislative and municipal elections. Venezuela is holding presidential elections, but they’ll be far from free and fair. Fabricio Alvarado has a slight edge but it’s a technical tie, and rising economic concerns could help Carlos Alvarado in the April 1 runoff. In an election marked by social conservatism, ticos will choose between Carlos and Fabricio Alvarado on Easter Sunday, April 1. Fabricio Alvarado maintains his lead in the final poll before the February 4 vote, while Carlos Alvarado makes big gains, and Juan Diego Castro tumbles. After decades of steady bipartisan politics, in 2018, Tico voters keep changing their minds about who they’re going to vote for on February 4, say two University of Costa Rica pollsters. A closer look at the leading candidates in this year’s presidential elections. Here’s what you need to know about an end to the Castro presidency, new migration rules, Russia ties, and more. Just before the February 4 first round, court rulings have stirred the social order in the traditionally conservative country. As business mogul Sebastián Piñera gets a second stab at the presidency, we look at the implications for legislation, markets, and trade. 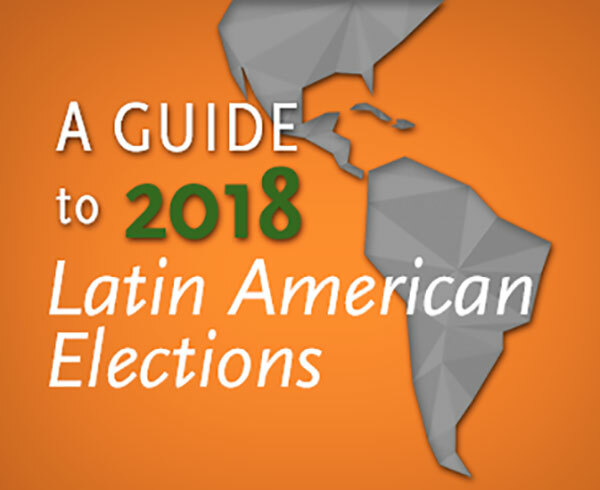 As Bolivia’s Evo Morales eyes a fourth consecutive term, we look at other places in the Americas where the topic of reelection has made waves in recent years. After days of delays and technical glitches, updated tallies put the president ahead as the country slides into its biggest political crisis since 2009. If there’s one lesson to be learned from recent polling debacles, it’s that voters should never base their decision to head to the ballot box on them. Polls indicated incumbent Juan Orlando Hernández’s reelection, but corruption concerns appear to have given a leg up to former sportscaster Salvador Nasralla. Polls show President Juan Orlando Hernández could win a second term on November 26 in a country where the issue of reelection sparked turmoil eight years ago. Polls got it wrong and all eyes are on which way losing candidates’ votes will go when Alejandro Guillier and Sebastian Piñera compete in a December 17 runoff. Sebastián Piñera will likely win the November 19 vote, but turnout will be key for his rival to stand a chance in the runoff, says political scientist Patricio Navia. Without conflict to bring them together, Colombians are confronting their differences, and engaging in the messy business of democracy. With more than two dozen potential candidates, Colombia’s 2018 race is up for grabs. Is there room for surprise among so many familiar faces? The president's center-right coalition swept Argentina's biggest provinces in mid-term elections, opening his path to reelection in 2019. Investors and policymakers need to watch the region's election wave, write AS/COA’s Brian Winter and Igarapé Institute’s Robert Muggah for ForeignPolicy.com. The October 22 vote will determine how much sway President Maurico Macri’s coalition will have in Congress, as well as Cristina Fernández de Kirchner’s return to politics. Listen: Now heading candidate Sebastián Piñera’s economic platform, former Finance Minister Felipe Larraín talks tax reform, copper, and more. Get background on the issues dominating the 2017 campaign trail and the presidential candidates leading the polls. The race to replace outgoing President Juan Manuel Santos is on, with candidates from across the spectrum.